The Original Teenage Fashion Model Barbie Doll is a reproduction of the very first #1 Ponytail Barbie from 1959, released in celebration of Barbie's 50th anniversary. This is a reproduction of the Barbie Doll that was introduced at the New York Toy Fair on March 9, 1959. 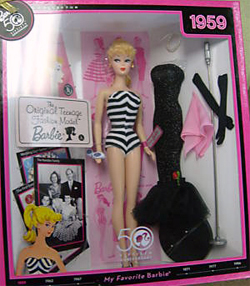 Barbie has a blonde ponytail and is wearing her original black and white zebra striped swimsuit. Mattel says that is this their "most faithful" vintage Barbie reproduction ever. She even has holes in the bottom of her feet, just like the first 1959 Barbie Doll. This doll is a "giftset" and includes a reproduction of one of Barbie's most famous vintage ensembles - Solo In The Spotlight #982 (1960-1964), which comes fully accessorized. A reproduction vintage booklet is also included, along with 50th anniversary collectible cards that portray a vintage image reproductions on one side and Barbie facts on the back. This is the first in the My Favorite Barbie series, a series of six vintage Barbie reproductions to celebrate Barbie's 50th. It was released in January 2009 with a retail price tag of $39.95.